The SWR Warlock series suppressors are small, lightweight and capable of greater than 41db reduction dry when used on a pistol. The Warlock is constructed from high tensile strength aluminum alloy with a hard coat anodized finish. The stainless steel back cap prevents damage to the suppressor from thread wear and cross threading. Maximum stealth in a small package. The Spectre is a true multi caliber suppressor. Rated for full automatic 22lr or semi automatic 5.7mm, 17HMR, 22WMR. Made entirely from high strength 316 and 17-4 stainless steel alloys. The Spectre can be fully disassembled into its individual components for cleaning. The included "pusher" tool allows the user to easily remove the baffle stack. 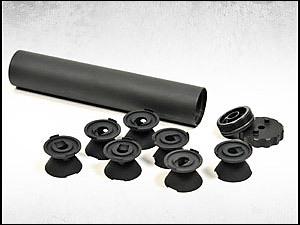 Say hello to the baddest technology in .22 silencers. Using our latest internal designs, the ELEMENT offers a revolutionary level of sound reduction in a compact, incredibly light-weight package that can readily be disassembled for cleaning by the user. The baffles and end caps are heat-treated 17-4 stainless steel, while the tube is ultra-durable SCARmor™-coated alloy steel. This construction allows the ELEMENT to handle .17HMR and .22Mag without modification. The PILOT 2 is a compact, durable, and light weight .22LR muzzle silencer for pistols & rifles. Since 2003, the original PILOT has been one of the best selling silencers available based on outstanding sound reduction, AAC quality, and attention to detail. Updated for 2011, the PILOT 2 allows easy takedown for cleaning and maintenance that can extend the can's service life when shooting dirty .22LR ammunition.